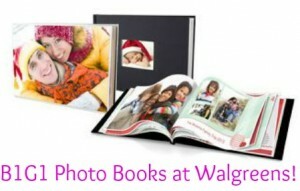 Don’t miss a new Walgreens Photo coupon code available right now for Buy One Get One 8.5″ X 11″ Photo Books when you use coupon code BOOKITBOGO during checkout. The books are even available for same day pick-up at your local Walgreens (which means free shipping). This would be great for gifts plus they are a great way to display all your favorite memories in one place! This makes photo books as low as $9.99 each after the code! Offer valid thru 4/2. Choose in-store pick up to avoid shipping costs.